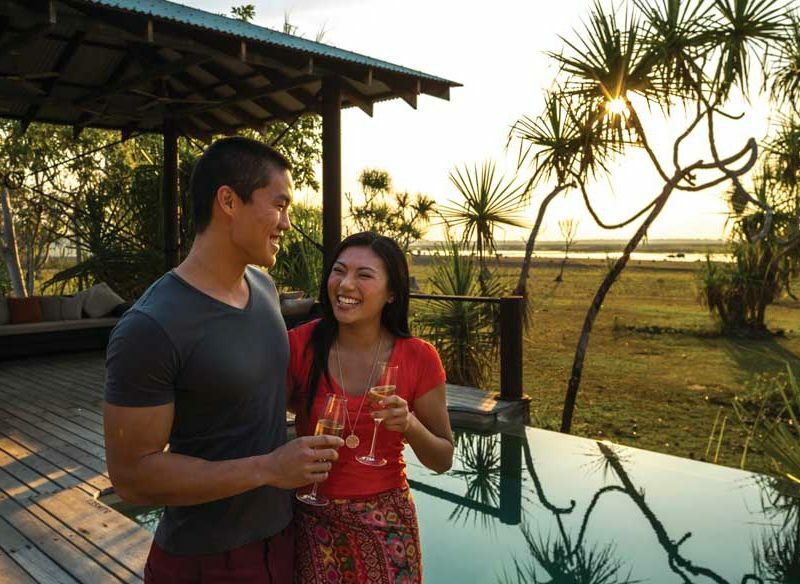 Couple enjoying champagne and the beautiful views at Bamurru Plains. NT. Rustic cabins and safari tents perch on white sand dunes, giving way to glorious untouched beaches at Banubanu Wilderness Retreat. The setting is the northern tip of far-flung Bremer Island in north-east Arnhem Land. Seriously quiet and seriously remote, tiny Bremer Island is inhabited only by a small number of Yolngu people and is accessed via a 15-minute flight from Nhulunbuy. The simple accommodation is built using materials found locally and jetsam washed up on the shore. Guests are invited to learn about the Yolngu people through basket weaving, spear making and catching crabs with local fishermen. If you’re looking for a secluded, romantic and tranquil place in which to wind down, sleep soundly and indulge in thoughtfully prepared food, Cicada Lodge should be on the list. Set high on the cliffs above the Katherine River, the indigenous-owned Lodge is designed to honour the ancient landscapes of Nitmiluk National Park. There are only 18 luxury suites, each with a private balcony, allowing you to immerse yourself in the sounds and sights of the bush and marvel at spectacular views of the stone country. There may be Champagne on arrival and canapés poolside, but it’s the many natural and cultural attractions, such as a helicopter ride with an indigenous guide to a remote rock art site, that take this stay to the next level. It’s the old-fashioned hospitality and proximity to the spectacular West Macs that’s at the heart of the Glen Helen Homestead Lodge experience. A 90-minute drive from Alice Springs, Glen Helen offers a range of basic accommodation options from motel rooms to swags under the stars. What it lacks in mod cons, it sure makes up for with outback charm and, of course, its spectacular views over the towering sandstone wall of Glen Helen Gorge. There’s also views aplenty from the jolly bar and restaurant where local larrikins rub shoulders with grey nomads and European backpackers over kangaroo steaks and cold beer. In the wilds of Kakadu, on the banks of Yellow Water Billabong, is the very comfortable Cooinda Lodge with its tropical lagoon pool and top-notch bistro. Provided you can haul yourselves out of bed, the dawn Yellow Water wildlife cruise rivals the most spectacular of sunsets. A private fishing trip at dusk should also be on the agenda. Popular with Top End locals, Cooinda makes a great base for exploring Kakadu, offering easy access to Warradjan Cultural Centre, Jim Jim Falls, Twin Falls, Ubirr and Nourlangie. Best known as the setting of the books of Australian author Sara Henderson, Bullo River Station is a working cattle property turned luxury farm-stay. Experience the patchwork of landscapes from waterfalls and gorges to grassy plains and ochre-coloured escarpments from atop a horse or by helicopter, or from the comfort of the homestead verandah. For the adventurous, activities abound, from mustering cattle and horse riding to learning how to crack a whip or brand a steer. Otherwise, meander along bush trails for a private swim in a remote waterhole or enjoy a romantic picnic under a glorious boab tree.